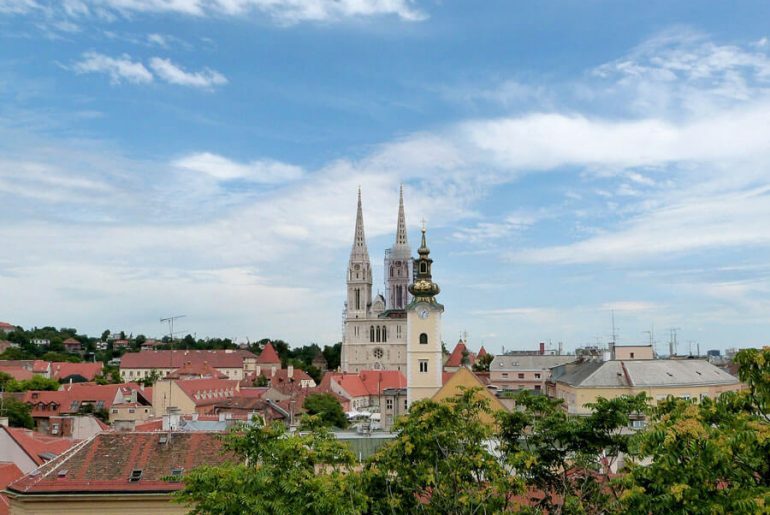 Zagreb is really a hit or miss destination for a lot of people. 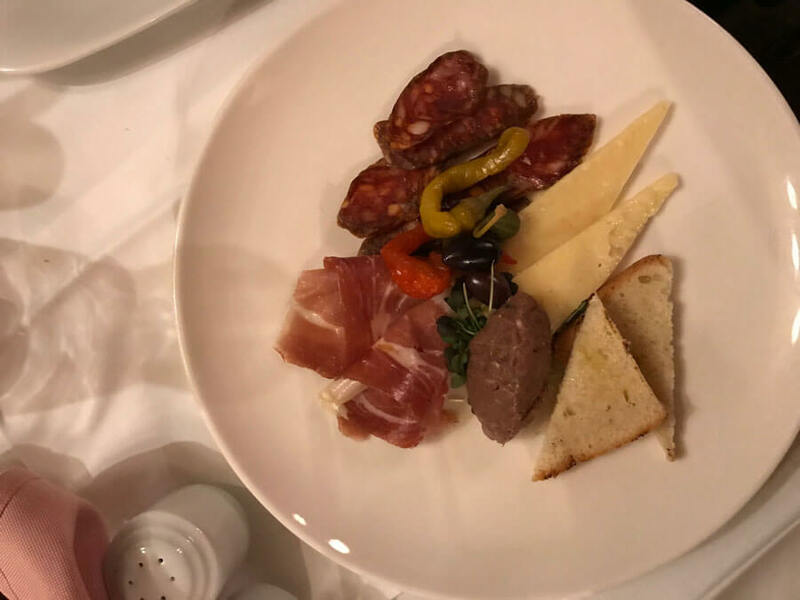 I recommend stopping by if you are travelling between Slovenia and Bosnia & Herzegovina as it is a beautiful capital city with lots of culture, stunning architecture and a rich food scene. There are plenty of things to do in Zagreb for every type of traveller, too. 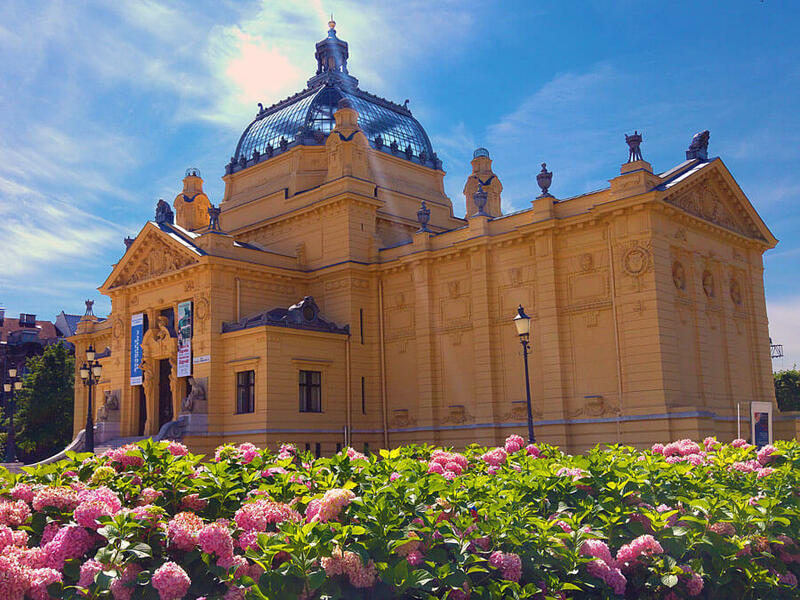 Zagreb can be perfectly explored in just 2 days but if you want to stay for longer it is easy to take day trips or to spend your mornings relaxing in cafes and afternoons soaking up the sun in one of the many parks. 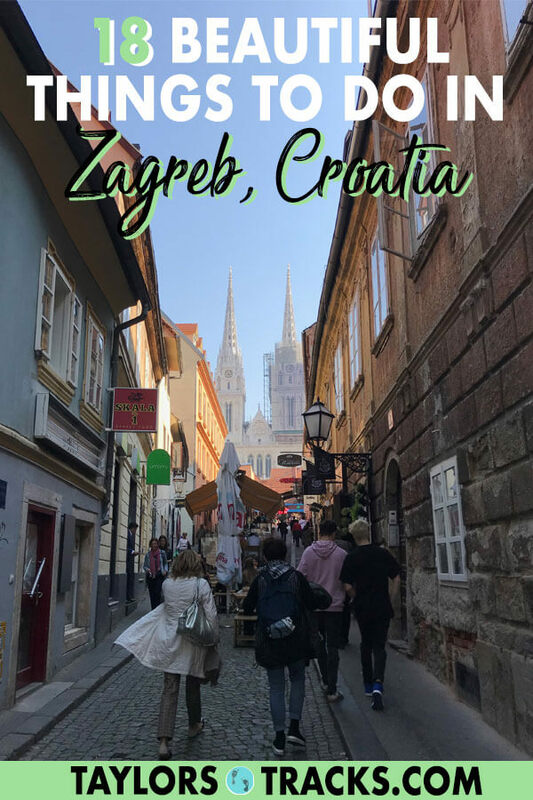 3 Planning your trip to Croatia? You’ll love these posts. All prices are quoted in Croatian Kuna. Check up to date conversions here. 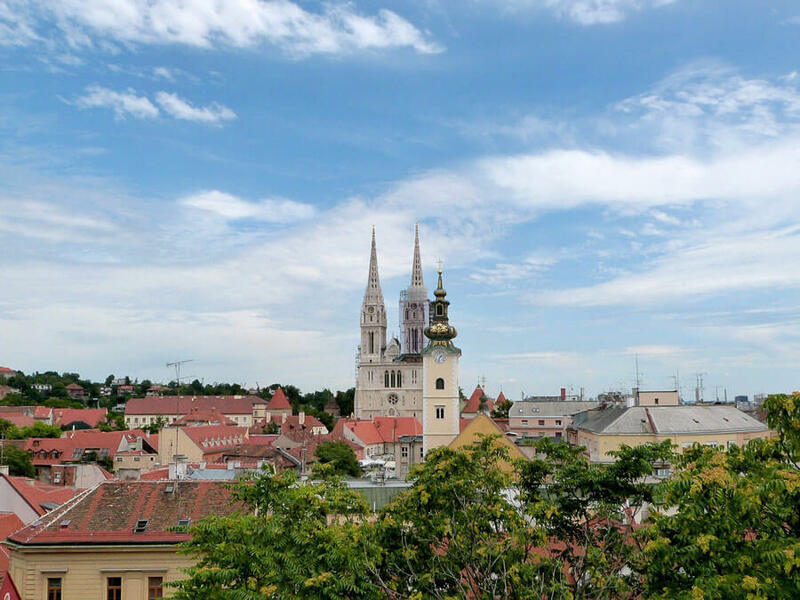 Discover what to do in Zagreb to create the perfect Zagreb itinerary. See lots of Zagreb tourists attractions on a walking tour. Most free walking tours will take you through Upper Town as it’s the most beautiful part of the city and has the most highlights in one area. 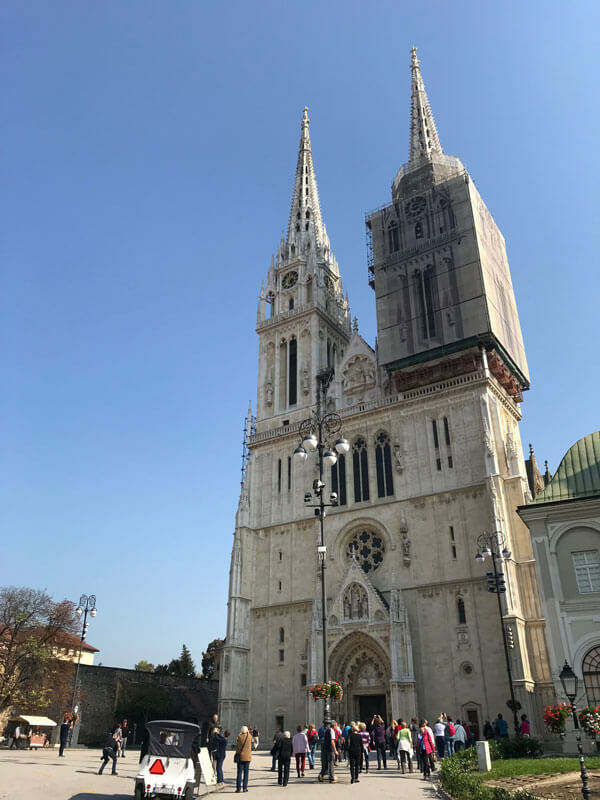 What to visit in Zagreb: the Zagreb cathedral. I have been in a lot of cathedrals in Europe but this one still impressed me so I think it deserves the title of one of the top things to do in Zagreb. It’s the tallest building in all of Croatia, standing at 108m (354 ft). It’s a Gothic style cathedral with tall spires that was originally built in 1093. It was then rebuilt in the 13th century then an earthquake hit and damaged it in 1880. The church has been under construction or restoration constantly so don’t be surprised to see some scaffolding when you stop by. Inside is still gorgeous and it’s free to enter (bonus!). It’s rumoured that the chandeliers came from Las Vegas! What a trendy cathedral. Zagreb things to do: drink all the coffee. Zagreb sightseeing is not complete without stopping by a cafe. Coffee is life in Croatia. The locals have perfected the art of savouring a small cup of coffee for hours and people watching. 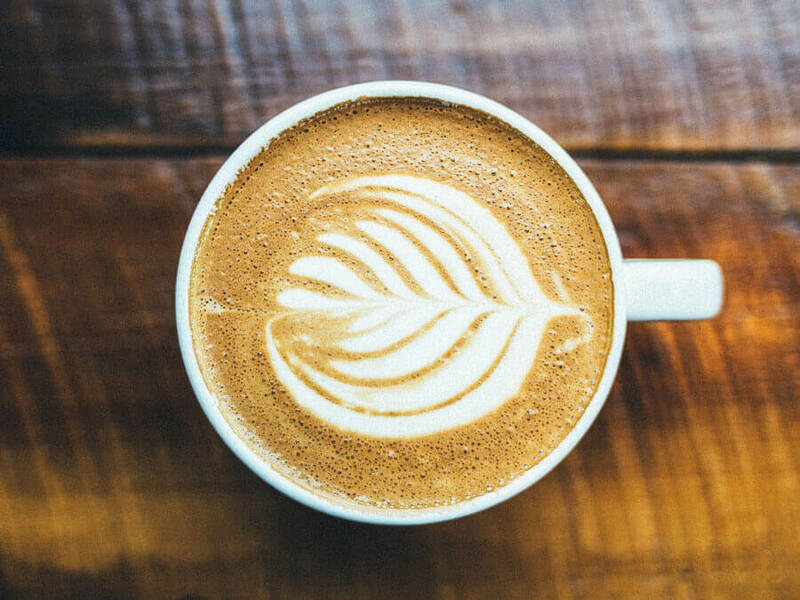 So if either are your thing then find a cafe and get cozy, you’ll blend right in while enjoying a warm cup and get a peek into life in Croatia. This is by far the most unique Museum in Zagreb, if not all of Croatia or even Europe. The museum is small but totally worth going to and is I think one of the best things to see in Zagreb. It displays personal items that are from past relationships that people send in from all over the world. Short stories accompany each piece so you get an idea of the relationship. It features not just romantic relationships but also friends, parents and children and more. The objects change so you can revisit and find new stories. Zagreb what to do: Ride the funicular. 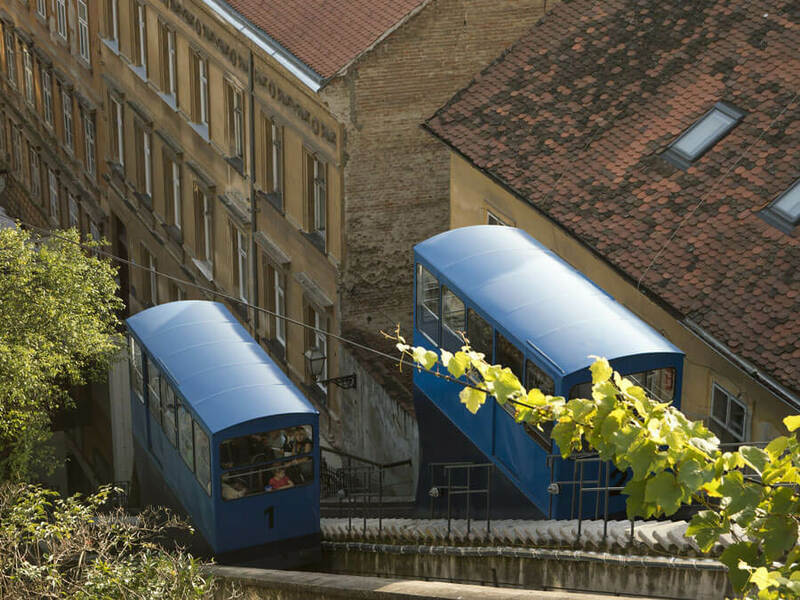 Zagreb’s funicular is totally unnecessary but still fun. The track is only 66m (217 ft) and the ride takes a total of 64 seconds up a steep 52% incline. The ride is short and cheap (4 kuna) and saves you from walking the stairs between the upper and lower town from Ilica Street and Strossmayer promenade. What to see in Zagreb: the beautiful parks. Zagreb is a gorgeous capital city, firstly because of the architecture and secondly because of the enormous amount of green space that’s in the city centre. The most relaxing of all Zagreb activities is visiting the combination of architecture and parks of the Green Horseshoe which connects eight squares throughout Zagreb’s centre that are in a u-shape around the town. At the southern end of these squares (Zrinjevac, Josip Juraj Strossmayer, King Tomislav, Ante Starcevic, Lenuci Fitness Park, Marko Marulic, Ivan Mazuranic and Republic of Croatia) there is the Zagreb Botanical Garden. Expect lots of colour in the gardens and on the buildings, grand architecture and to see mansions where some of Croatia’s richest residents used to live. Be sure to stop by the Dolac Market. 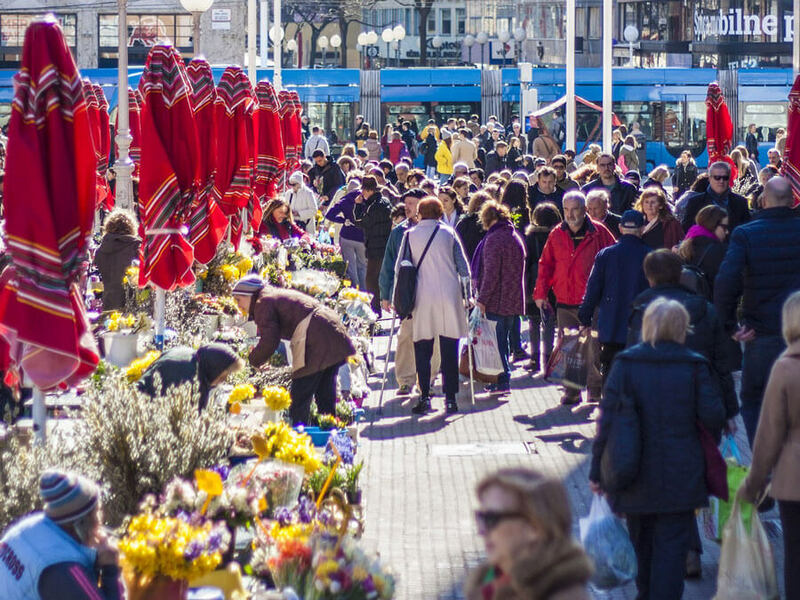 Dolac Market is a farmers market and one of the best places in Zagreb that’s right in the heart of the city. It’s right by the main square and spans across two levels. You won’t find just food but also clothing and souvenirs. Fresh fruits and veggies are in the open air section while in the lower section is an enclosed fish market, bakeries, butchers and more. Views from Zagreb Upper Town. Upper Town is the most historic part of Zagreb as it is the oldest and most romantic part too. The name gives it away, it is the upper section of the city that sits higher on Medvednica Mountain. Zagreb tourism always involves a stop in Jelacic Square! Jelacic Square is the most architecturally rich part of Zagreb. It is the main square and is a lively spot surrounded by the colourful buildings that date back to the 19th century. You’ll find many different styles of architecture from Art Nouveau to post-modernism, and Biedermaier here. 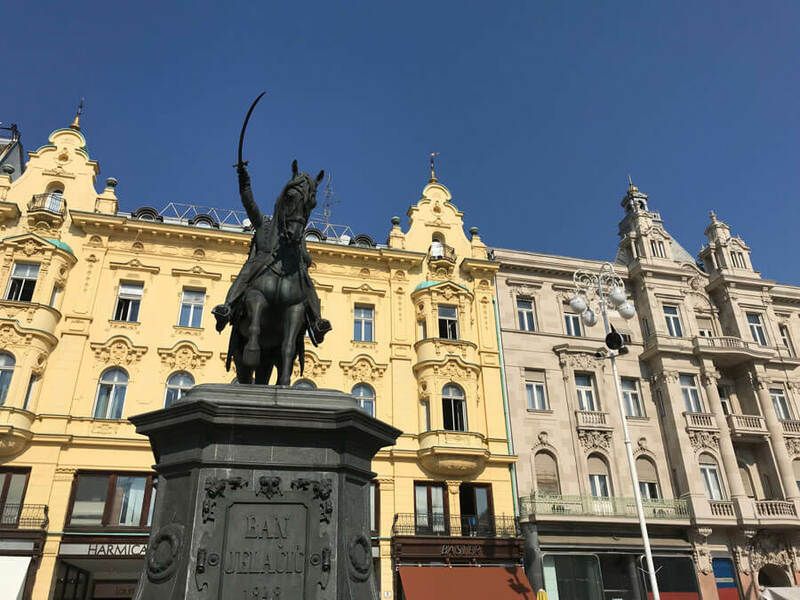 Highlights in the square include Kras, a chocolate and candy store, Zagreb 360° for awesome views of the city and the Jelacic statue that stands in the middle of the square, an army general whom the square was named after. Tkalciceva Street is the best place in all of Zagreb for people watching, grabbing food and enjoying some leisure time. The street is pedestrian only, extremely charming and has an abundance of cafes and restaurants to enjoy any time of the day. The mornings are peaceful, afternoons bustling and in the evenings the street comes alive with locals and visitors alike who are enjoying food and drinks. The street used to be a river that separated two areas, Kaptol and Gradec but now the streets connects Jelacic Square and Mala Ulica. I had way too much fun here. 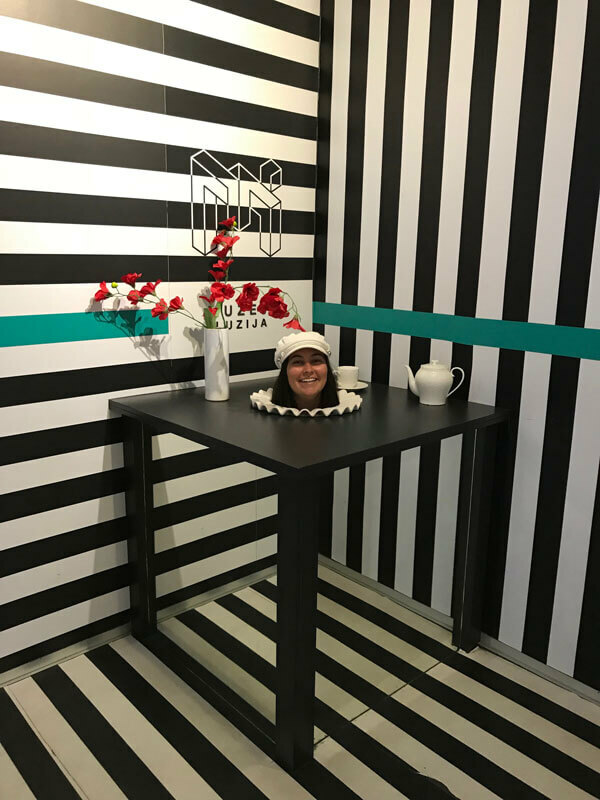 It may sound silly, going to a Museum of Illusions in Croatia’s cultural capital but it’s actually one of the most fun places to visit in Zagreb. I would never have picked this as something to do but I went with some friends and acted like a child snapping funny pictures and giggling over the illusions. It is quite popular and gets busy so be sure to head over in the morning! There’s even a tour that takes you through the Museum of Illusions and the Museum of Torture. Book Illusions of Torture Walking Tour! One of the entrances to the tunnel…it’s super creepy at night! There is a tunnel that runs under the hill that’s below Upper Town so people can skip walking up and down the stairs. 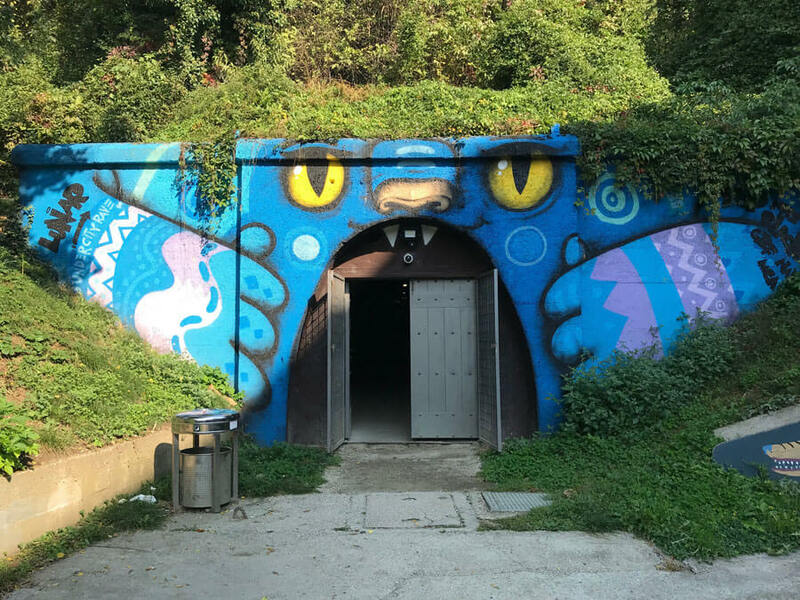 The tunnel itself is quite eerie as it was originally built as a war bunker in WWII but is commonly used as a pedestrian shortcut and even hosted Croatia’s first rave in 1993. Today tours run through the tunnel that explain the history of the Homeland War which broke up communist Yugoslavia. 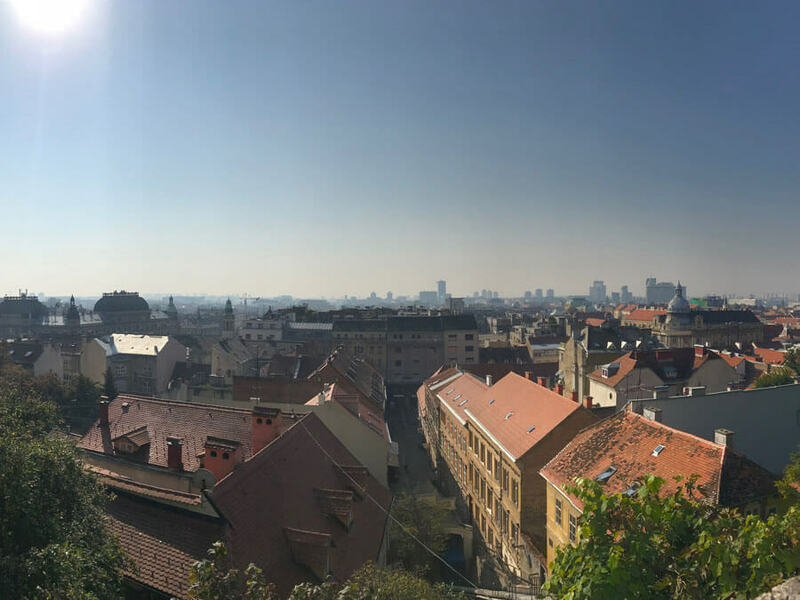 For the best views of Zagreb city, head to the top of Zagreb 360° for panoramic views over the terracotta rooftops and modern downtown. There is a bar and restaurant on the 16th floor and on a clear day you can see as far as Slovenia. It sounds odd to mention a cemetery as something to do in Zagreb but this cemetery is really quite beautiful as it was designed more so as a park than a cemetery. It was built in 1876 and has stunning architecture for a cemetery. The most beautiful part is that it isn’t dedicated to just one religion so will spot crosses and the Star of David side by side on gravestones. Some of Croatia’s most famous residents are buried here and the architecture was designed by one of Croatia’s top architects, Herman Bolle. It is a bit of a trek to get to so give yourself time. It is possible to walk to from the lower/upper town but it will take 45 minutes to an hour. Lake Bled, Slovenia is one of the best Zagreb day trips. 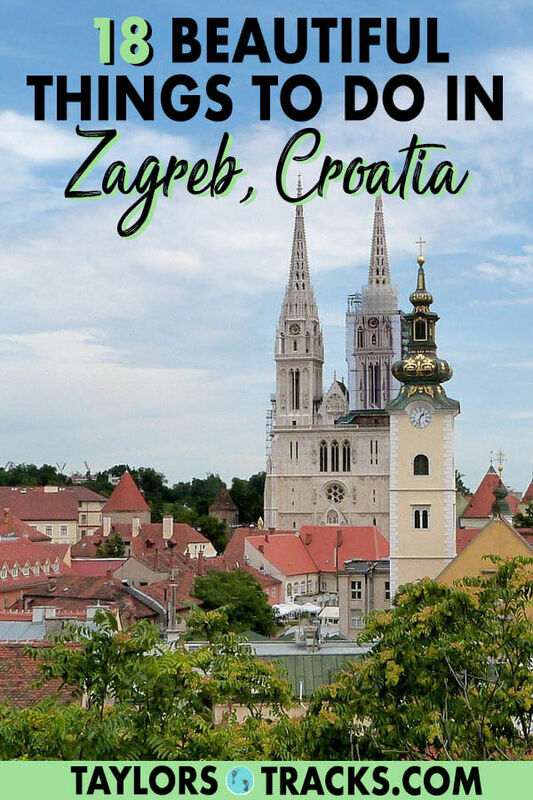 This capital city is in a great position for a number of spectacular and scenic day trips from Zagreb both within Croatia and even to Slovenia (one of my fav countries I may add). The most popular day trip from Zagreb is to Plitvice Lakes National Park, as it sits between Zagreb and Zadar. I’m sure you’ve seen pictures of this national park, it is often the postcard pictures for Croatia. Plitvice Lakes has beautiful blue and emerald waterfalls, hiking trails and wooden paths that wind through and overtop of the shimmereing waters. If you want to squeeze in a new country while you’re visiting Croatia then hop on over to the neighbour in the north, the absolutely breathtaking country of Slovenia. On a day trip you can hit up the two most popular spots in the country, the capital, Ljubljana and Lake Bled, both of which are very picturesque and worth visiting. 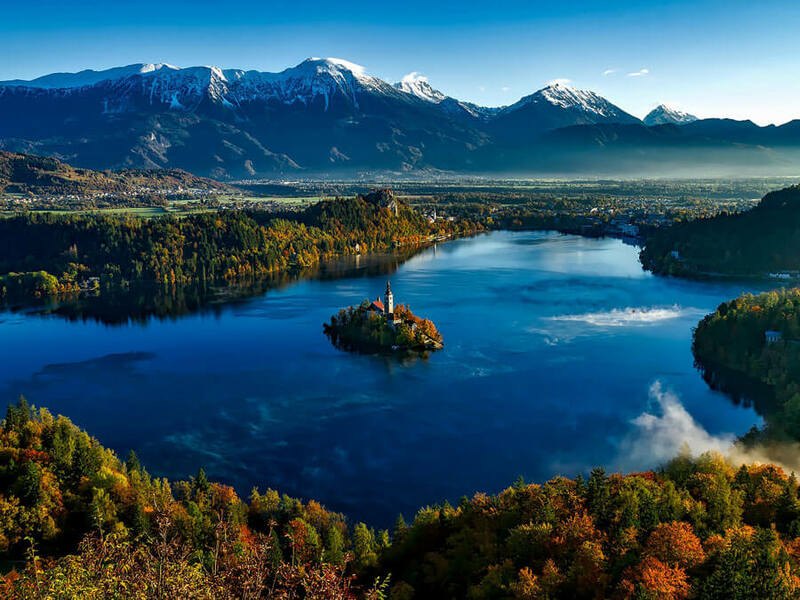 Book Ljubljana and Lake Bled Tour! Zagreb is Croatia’s cultural capital and with that title comes a ton of museums for every type of traveller. I’ve already mentioned the Museum of Broken Relationships and the Museum of Illusions because of their uniqueness but there are more classic museums, galleries and other unique ones too. You can find even more and details in this Zagreb museums article. Zagreb not only has an amazing cafe scene but it’s also a paradise for foodies. I mean if you haven’t tried Croatian food yet then you need to. A food tour is the perfect way to do that so you can to taste all of the best things without spending a fortune on so many dishes. Book Traditional Culinary Walking Tour! Everyday a cannon is shot from the Kula Lotrscak tower to signal mid-day which can be heard from all over Zagreb. It is someones job to shoot the canon every day and that’s all he has to do…how awesome is that?! You can also climb up the tower for great views of the city since it’s in the Upper Town and has the best view of St. Mark’s colourful tiled rooftop. 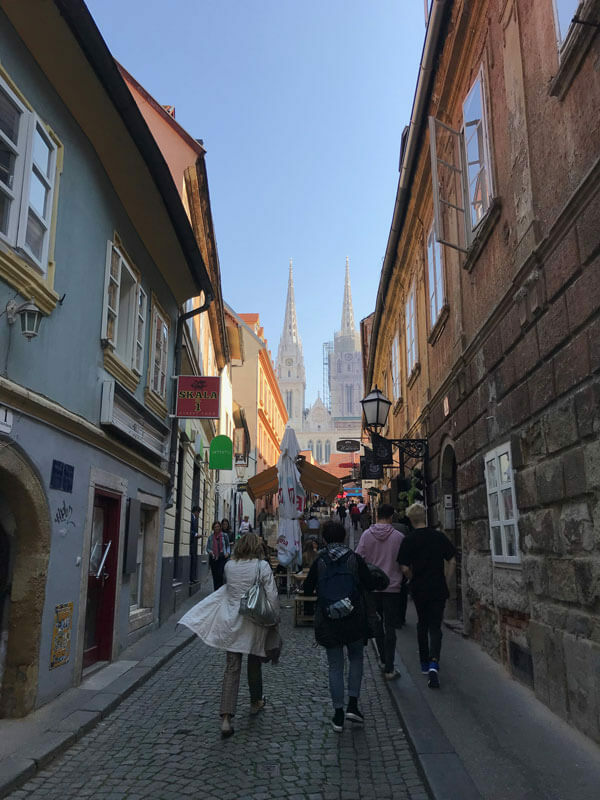 Read my detailed Zagreb accommodation guide to find the best places from budget to luxury, hostels to hotels and apartments. Planning your trip to Croatia? You’ll love these posts.